Editor's Note: we have written an article on preventive measures during the cold and flu season: Prevention. However, there are two products on the market that you must read about EpiCor and Del Immune V™. If you want to prevent a cold or flu, EpiCor and/or Del Immune V™ is better than a flu shot. Keep in mind that if you catch a cold or flu, EpiCor will not help, while Del Immune V™ has been known to knock out a flu bug in under 12 hours. Additionally, if you want to check out Diamond V XPC, the original animal feed from which EpiCor is derived, click here: DVXPC. The CURRENT flu itself is a strange mixture no one has ever seen before, and conspiracy theories are as pandemic as the flu itself. However, could something like this be created in a laboratory? Yes, and, in fact, the CDC was working on exactly that. Finally, I've actually used this research to beat the common cold. We have anecdotal evidence (over 20 individuals) who've reported to us (they were all asked to report back, and over half of them did so) that this was successful more than 90% of the time. To read about this, click here: Conquering the Common Cold. I just read an article that said children hit by the flu were very hard to treat. Allopathic medicine (conventional or traditional medicine) has no cure for colds and flu. It treats symptoms only, and for the last time in this life I want to tell you: Treating symptoms suppresses your immune system which is the only thing you have to help you beat a cold or flu. A symptom is your body's immune system fighting back. A sore throat is hyperthermia, a situation that tries to kill the bugs. A fever is hyperthermia; for every degree rise in temperature, your lymphatic system flows twice as fast. Phlegm and stuffiness are your dead immune cells. They died and now have to be cleared out of your body. Suppress your symptoms and you suppress your immune system and the bug wins. Here are some naturopathic means of aiding your body in ridding itself of a cold or flu. People who take a good multivitamin, get their omega-3s, spend time outdoors and get some exercise have fewer colds and flu than those who don't get these. We need our antioxidants, bioflavonoids, essential fatty acids, and vitamin D to maintain our immune systems. Vitamin C is essential, and everyone should discover how much their bodies need. Add some resveratrol (we can't get enough from our food) and take 5,000 IU of vitamin D daily, but be sure to have your vitamin D levels measured yearly. Too much vitamin D is not good either. We've written tons on this essential nutrient, vitamin D; how it protects against cancer, how it seems acts like a hormone, but we haven't mentioned (and I'm updating our pages on the immune system right now) how vitamin D enhances our immune system. In 1945 a Dr Hope-Simpson was studying influenza outbreaks in temperate regions and the tropics. He noticed that they tended to occur during the "cloudy" months, such as in the winter and in during the rainy seasons. He theorized that lower amounts of vitamin D were responsible for these outbreaks, and in the year 2003 investigators confirmed that the good doctor was right; flu epidemics occurred during the rainy seasons when getting vitamin D was darn near impossible. Health sites and physicians who know nothing about nutrition seem to recommend 200 IU daily of vitamin D. However, those who seem to know what they're talking about recommend an optimal daily amount of 5,000 IU of vitamin D. Vitamin D deficiency is at pandemic levels among industrialized nations. This is not a silver bullet, but at times, seems like the next best thing. I've seen a flu bug go away in just eight hours after drinking BACO. A normal dosage is a teaspoon to a tablespoon daily. If you're sick, you can take an ounce, put it in a liter and sip all day long. I caught some kind of cold that involved allergies while on the road and a teaspoon did not work. I finally took it triple strength (a tablespoon) and then put about an ounce into my drinking water and sipped all day long. Then, along with all the other things we recommend below. it finally ended. We are currently writing a book on BACO, so you might want to go here and read what we've written so far: BACO - A Blessing and a Miracle. To purchase BACO, we have another surprise for you. It used to be sold by rip-off artists online for $450.00 a bottle. We are in touch with the person who has taken over the company after the inventor died, and Simply the Best can get it to you for $100.00 per bottle. When it comes to BACO, less is best. Take a teaspoon to begin with. If that doesn't work, double it. The most you ever want to take is a tablespoon. Take it under the tongue and hold it as long as you can then swallow. Increase your vitamin C. I use Now's Ester-C Complex 90Tabs but if you take a straight Vitamin C, then you'll have to add bioflavonoids, some calcium, copper, and L-lysine. Vitamin C is, for modern naturopaths, a complex. For an average sick adult, 15,000 to 20,000 mg is about enough. (We say sick because your need of vitamin C increases with illness.) If you get diarrhea, you've taken too much. But it's only diarrhea, and not the end of the world. Vitamin C is used in large doses in Europe for constipation. Vitamin C expert Robert Cathcart, M.D., specifies very high therapeutic doses of vitamin C. For a severe cold: 60,000 to 100,000 milligrams/day. For most influenza (flu), 100,000 to 150,000 mg/day. For Avian (Bird) Flu, 150,000 to 300,000 mg/day. This amount is taken over a day's period, by sipping juice with Vitamin C in it all day long, or by taking 10, 15, of 30 tabs per hour. At a rate of ten tabs per hour of Now's Ester-C Complex 90Tabs, you'll use up the entire bottle, 90,000 mgs, in nine hours. This means you're going to have to have a LOT of vitamin C on hand when the flu hits. Personally, I've used 100,000 mgs per day for five days. When tested for damage from the flu bug, they found nothing, though I was still very sick. With this in mind, I've posted in the left column all the different vitamin C products I took during that terrible flu spell. Next whip out some good echinacea. The best is made from Echinacea Angustifolia. A good strong tincture (it should burn in your mouth) is the best. Take at least 3 dropper squeezes (droppersfull) under your tongue. Yes, it smarts. You can take up to an ounce, but it's hard to get down. Never take echinacea for longer than two weeks at a time and never take it with goldenseal (with astragalus is okay.) For more on echinacea, to here: Echinacea. Master herbalists tell us that echinacea mixed with goldenseal drives the infection deeper and deeper into the body. Take them separately. Nothing kicks your T-Cells into gear like echinacea, but your immune system needs still more, so keep reading. Next you'll need an immunostimulant. We've just completed research on a substance originally from Russia called Del-Immune V™. It could easily be the most powerful immune system stimulant available. To read about it, please go here: Del-Immune V™. When the cell walls are fractured, the immune-activating proteins are available to do their job. This fracturing process is called "lysing." Original Russian research conducted in the 1980s demonstrated the proteins and other components in the cell wall "activate and excite" an important switch in our immune system. I like my Agaricus Blazei Murill or ABM mushrooms. You can substitute Transfer Factor Plus, or MGN-3, or Beta Glucan, or even IP-6. All of our sources for these mushrooms are now defunct. If you find them, please write to us and tell us where they are: info@mnwelldir.org. I like to mix my mushrooms all up: some shitake, mitake, and some ABM. Keep in mind that the mushrooms from the rainforest are much more powerful than the ABM mushrooms from anywhere else. One particular form of mushrooms that I happen to like and use when I get a tickle in my throat (used in cancer protocols in the Orient) is the AHCC. Editor's Note: As of 6/21/14, Mitobi Enterprises and agaricus net are no longer in business. We are looking for suppliers of their products. Personally, now I buy my mushrooms at an Asian market. Even more immune stimulants can be found at www.longevityplus.net and check out Immuni-T, Immuni-T2, Immuni-T3, and RM-10. The Beyond C there is a great form of vitamin C.
One product I've found is a Cold & Flu formula from Jenny Q's Herbal Remedies. Talk about a mom and pop organization, this one's just mom. She mixes echinacea with shitake and reishi mushrooms and a few other great things. Her phone number is 800.933.3197. OPCs (Oligomeric Proanthocyanidins) are powerful antioxidants that appear to slow the aging process. The list of successful studies (varicose veins, injuries, catracts, blood clots, impotence, ADHD, hemorrhoids, lupus, etc.) goes on and on. What is important here, when your body is fighting off an infection of a cold or flu virus, the system needs support to help clear out the dead immune cells, and antioxidant support is just part of it. When fighting off a cold or flu, adding OPCs to your regimen is highly recommended. N-acetylcysteine (NAC). In an Italian study, Researchers in Italy found that seniors taking 600 mg of NAC twice daily developed fewer flu-like symptoms and had influenza-like episodes less frequently. NAC helps boost levels of a disease-fighting antioxidant compounds known as glutathiones. Andrographis. A Chinese medicine herb (Andrographis paniculata) that is known to reduce symptoms of upper respiratory infections and congestion. Can be combined Siberian Ginseng (Eleutherococcus senticosus) which might provide even greater, synergistic benefits. High dosages can have side effects, such as changes in blood pressure. Elderberry extract. Studies show that this extract of Sambucus nigra stimulates the immune system. In a limited study in Israel, researchers found that people taking elderberry extract experienced a significant reduction in symptoms such as fever in just two days. Ninety percent were symptom-free after only three days. See below for more. We've used it very successfully. Oscillococcinum. This top-selling homeopathic remedy for reducing cold and flu symptoms which has been found to reduce the duration of flu and flu-like syndromes. North American Ginseng. North American ginseng has, in one small study, shown to cut the length of colds by one-third while reducing slightly the odds of catching a cold. Zinc lozenges. Zinc is an antioxidant that stimulates the body's resistance to infection. Some research suggests that zinc lozenges reduce the duration of colds. Remember: you have to have these things on hand when the first symptoms hit. Take all these then go rest. If the cold or flu hangs on―is still there―then you have to accept this period as a chance to detox. And you can use the supplements above to palliate the symptoms naturally and shorten the length of your suffering. You will want to increase your beta carotene. Fresh carrot juice is the best way to get it. Add some superfoods from 1800-HERBDOC or go to www.herbdoc.com and order their superfood. Next you can make some homemade chicken soup. Use a fresh, organic, free-range chicken. Buying regular chicken soup (or a Golden Plump chicken) ain't gonna do squat for you. Ok? At least make sure it's raised chemically free and has had a healthy life free ranging if you can't find an organic one. Use the bones and fat. Add lots of garlic and cayenne. I actually torture myself at this point adding at least seven cloves of garlic (crushed up and let sit for ten minutes before adding to my bowl of soup and some cayenne. You WILL get some symptom relief here. Lately I've created a nasal spray using a drop of Oregano Oil, a drop of Grapfruit Seed Oil, and three drops of Eucalyptus Oil in acidic electrolyzed water. This has worked best for me so far. We've just discovered an essential oil mixture that can help some, especially as a preventive. 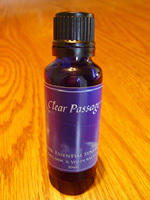 It's called Clear Passage and consists of (organic/wild crafted) Cinnamon, Citronella, Clove, Eucalyptus, Ginger, Lemon, mandarin, Mountain Savory, Nutmeg, Orange, Oregano, Rosemary, and Thyme. You can place a few drops on a ball of cotton and put it over an air vent, or put a few drops on a light bulb, or purchase an essential oil diffuser. Using coconut oil as your carrier, add a few drops and rub on your chest. You can get it by writing to panacea1@peoplepc.com. This is the same formula thieves used during the Black Plague; going from place to place robbing the sick, the dying, and the dead, but never catching the plague. If you get a fever, do not take Tylenol to lower your temp. Your body is fighting back. Keep hydrated and help your fever along. Take a nice hot bath. Add some eucalyptus oil to the bath, or some Clear Passage (above). Make some hot tea (old Doc Christopher loved raspberry leaf tea) with a little (not too much) honey and lemon. Keep up your vitamin C over this period. Keep on with the mushrooms. You won't need your echinacea if you took a lot up front. Keep juicing and making your soup and taking hot baths if your fever continues. I've taken up to 100 grams (100,000 mgs) of Vitamin C daily with no loose stool. I went to the VA to get checked up and was told that there was no sign of a virus in my body, even though at the time I'd had all the symptoms of the Nile Virus. My doctor was absolutely amazed. She said that my liver and kidneys were perfect, the first places to show damage from a viral infection. She told me that whatever I was doing, keep doing it, because it was working. And learn to meditate. Talk to your body. Listen to your body. Form a union. So often we treat our bodies as strangers. Get to know it. You'll be amazed how much you both have in common and how you can get thru these periods profitably. Spiritual profits are always a blessing. Because I do not have the knowledge to confirm or dismiss this information from PubMed, I'm going to just have to publish it here until someone who is knowledgeable comes forth to set us straight. A study from the University of Oslo in Norway, soon to be published in The Journal of International Medical Research took a group of people all suffering from the flu and gave each experimental subject one tablespoon of Sambucol (an elderberry extract developed by a Dr Mumcuoglu) four times a day for five days, while giving the control group a placebo (four times a day for five days). At the end of the study, those getting the Sambucol recovered from their flu in 3.1 days (average) while the control group averaged 7.1 days for their recovery. There have been no studies on the preventive use of Sambucol, but many people do swear by it and take it regularly during the cold and flu season. You can purchase Sambucol at most health food stores and online. Just plug "sambucol" into any search engine to locate a store selling it online. If you can't find Sambucol, I'm sure you can find an elderberry extract from another company. The black elder (Sambucus nigra) is a common tree throughout Europe and North America. The flowers are whitish-yellow and are strongly-scented. The fruits are a purplish-black, with a blood-red juice. Stone Age excavations have uncovered traces of elderberry. Hippocrates, the father of medicine, in 400 BC called the elder tree his "medicine chest" and wrote of its purgative properties. Supposedly, the wood of Christ’s cross came from an elder tree and Judas was said to have hanged himself from an elder tree. Although used extensively in folk medicine, in traditional medicine the elder tree also finds many uses with every part of the tree (except the pulp) having medicinal properties. The bark was used as a purgative, diuretic, and emetic. The leaves are used externally for treating bruises, sprains and wounds. Internally the leaves, too, act as a purgative, diuretic, and expectorant. The berries have anti-inflammatory and anti-viral properties, and, as we noted above, can be used in treating cold and flu symptoms as well as laryngitis, hayfever, and sinusitis. The berries are also used in making elderberry wine and elderberry jam, while the flowers are used as flavoring in Sambuca liqueur. The berries, because of their anti-inflammatory properties, are used for treating rheumatism, sciatica, neuralgia and arthritis. The berries are also thought to have some anti-viral properties, making them useful for colds and influenza. The berries contain vitamin C and many bioflavonoids, including rutin and quercitrin just to name two and, contain a high concentration of anthocyanins. Anthocyanins, derived from the purple pigments, have many medicinal properties. Ongoing research in Europe on the anthocyanins found in the elderberry has shown them to exhibit antioxidant activity, immunostimulant properties, anti-viral activity, cardiovascular protection, and even stress relief activity. No known toxicity or side effects are known to exist for elderberries, but as always, if you are pregnant or lactating, it's probably best to check with your physician or naturopath first. Is it any wonder that an old Austrian saying reminds us to "Tip your had to the elder?" Disclaimer: All information provided here has not been evaluated by the U. S. Food and Drug Administration. Nothing at this web site is intended to diagnose, treat, cure or prevent any illness or disease, and is not intended as a substitute for advice from your own physician or other health care professional. All information provided here is for information purposes only. Before beginning any diet, therapy, exercise program, or supplement you are advised to first check it out with a health care professional (hopefully one well versed in the route you choose to take). © Copyright 2008, 2016 Minnesota Wellness Publications, Inc.